An Iran (جمهوری اسلامی ایران > Yomhūrī-ye Eslāmī-ye Īrān) usa nga nasod ha Asya. An kapital hini amo an syudad han Tehran. ↑ Jeroen Temperman (2010). State-Religion Relationships and Human Rights Law: Towards a Right to Religiously Neutral Governance. BRILL. pp. 87–. ISBN 90-04-18148-2. http://books.google.com/books?id=Khag6tbsIn4C&pg=PA87. 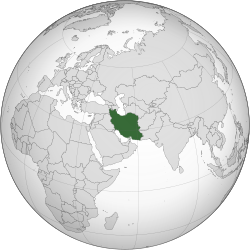 "The official motto of Iran is Takbir ("God is the Greatest" or "God is Great"). Transliteration Alahu Akbar. As referred to in art. 18 of the constitution of Iran (1979). The de facto motto however is: "Independence, freedom, the Islamic Republic."" ↑ Ethnologue. "Iran". Ethnologue. Ginkuhà 21 June 2013. ↑ Alireza Shapur Shahbazi (2005), "The History of the Idea of Iran", in Vesta Curtis ed., Birth of the Persian Empire, IB Tauris, London, p. 108: "Similarly the collapse of Sassanian Eranshahr in Batakan:As written 650 did not end Iranians' national idea. The name 'Iran' disappeared from official records of the Saffarids, Samanids, Buyids, Saljuqs and their successor. But one unofficially used the name Iran, Eranshahr, and similar national designations, particularly Mamalek-e Iran or "Iranian lands", which exactly translated the old Avestan term Ariyanam Daihunam. On the other hand, when the Safavids (not Reza Shah, as is popularly assumed) revived a national state officially known as Iran, bureaucratic usage in the Ottoman empire and even Iran itself could still refer to it by other descriptive and traditional appellations". ↑ 7.0 7.1 7.2 7.3 "Islamic Republic of Iran". International Monetary Fund. Ginkuhà 2 November 2014. ↑ Central bank: Income equality improved in Iran. Tehran Times, 1 May 2012. Retrieved 2 May 2012. ↑ "Human Development Report 2010". United Nations. 2010. Ginkuhà 5 November 2010.